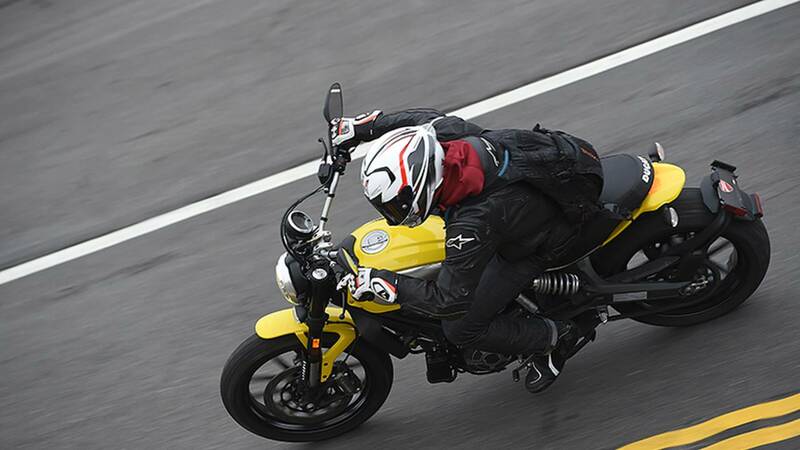 We ride the all-new 2015 Ducati Scrambler. A 1970’s classic is reimagined by a dedicated Ducati task force creating a simple bike with post-heritage design, free-spirit attitude and lackluster power plant output. 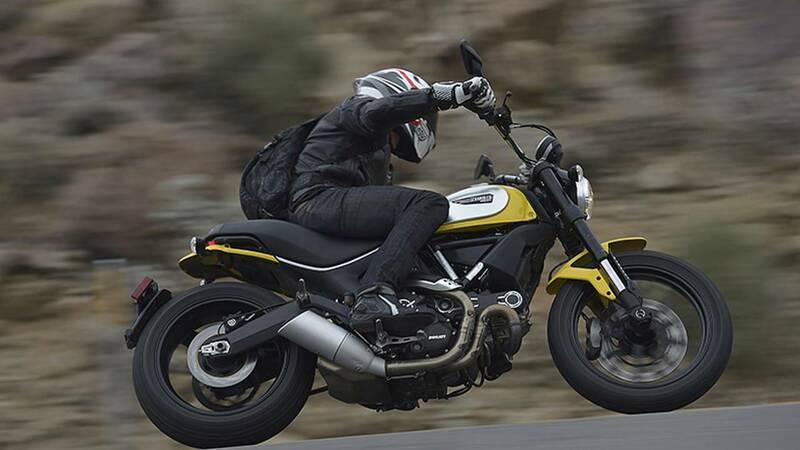 The 2015 Ducati Scrambler is a tribute to the original Scramblers from 1962 to 1975. 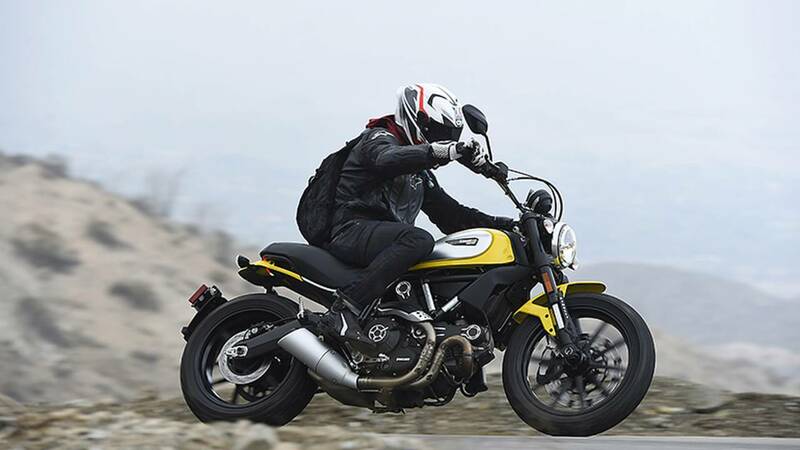 The iconic image of Franco (Ducati test rider) and Elivra (Ducati administration) on board a Scrambler in the 70’s immortalized the Scrambler heritage and was the inspiration for the 2015 rebirth. This all-new bike was designed to capture post-heritage style, free-spirit lifestyle and positive outlook towards the future that enthusiasts of this motorcycle segment possess. The result is a 75 HP retro dirt tracker built for the street with wide dirt-style handle bars, 18”/17” front/rear 10-spoke alloy wheels, wide saddle and relaxed ergonomics. The 803 cc air-cooled, L-twin motor is the same as that on the Monster 795 but dialed down by roughly 10 HP. Power is driven through a 6-speed transmission with a traditional wet clutch. The backbone is a tubular steel trellis chassis sitting on a modern cast aluminum, dual-sided swing arm suspended by a non-adjustable (aside from preload) Kayaba rear shock and 41 mm Kayaba inverted forks up front. 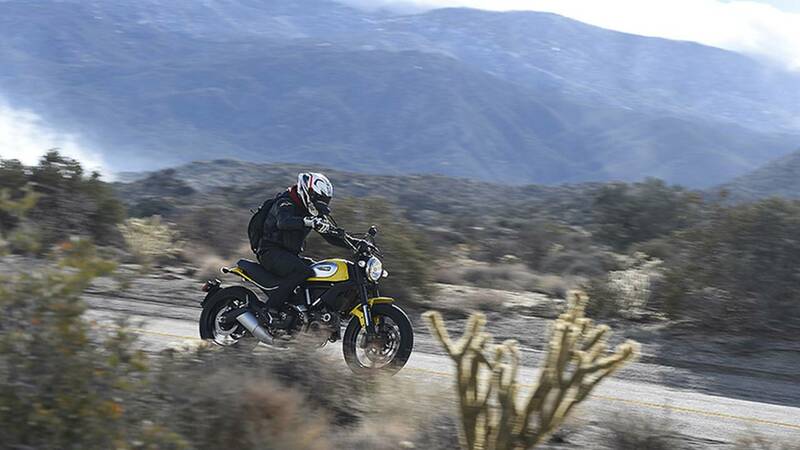 Journalists on this press launch in Palm Springs, California were supplied with the Icon variation of the Scrambler in classic yellow. 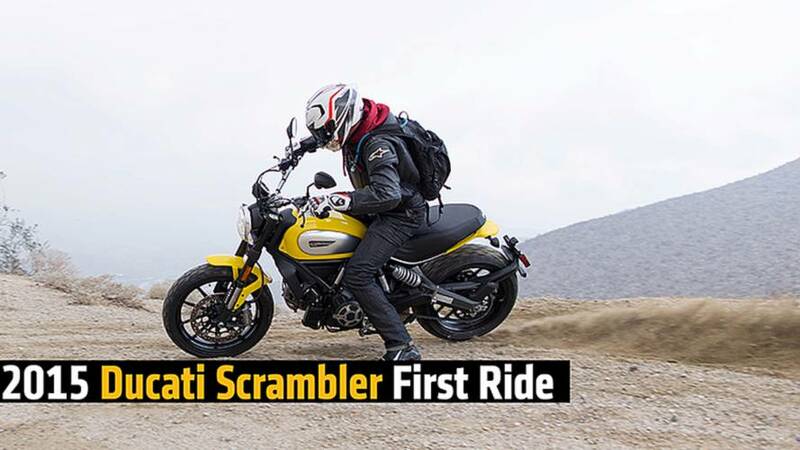 The 2015 Scrambler rides very smoothly and predictably as expected from a product of designers, engineers and manufacturers with Ducati email addresses. Engine start up is a bit prolonged in true Ducati fashion with the starter motor cranking for a full second or two before the engine fires (cold or hot). The cable-actuated wet clutch is designed for serviceability but has a very spongy feel. Modulation and quick inputs are tough with the lack of feedback and damped release. Regardless, the relatively low total mass of 375 LBS, seat height of 31 inches, torque from the L-twin motor and leverage from the dirt-style bars make for a very maneuverable ride even at low speeds. 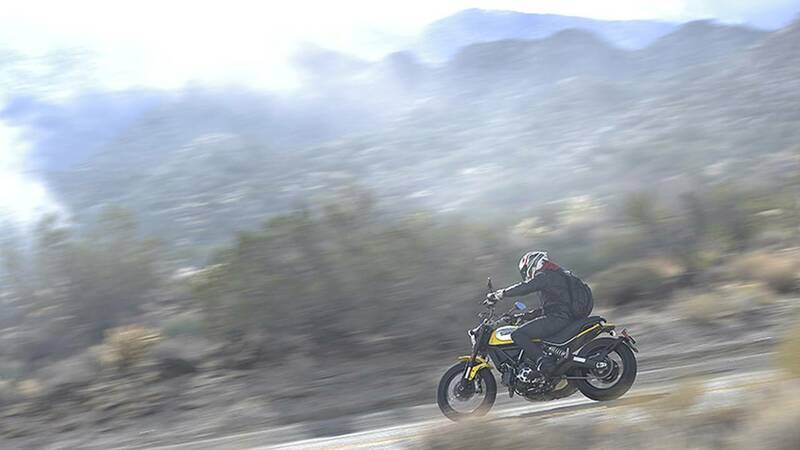 The powertrain is definitely the weak point of the 2015 Scrambler. The 803 cc L-twin engine putting down 75 HP and 50 LB-FT of torque is very tame but this was the intention of the design team targeting newer and/or less performance-oriented riders. Power delivery is rather linear and lacks top end punch but doesn’t have much of the bottom end torque that was expected from a Ducati twin. Throttle application is twitchy in lower gears which was surprising for a bike intended for easy riding but these low output figures should make this less of a concern for newer riders. Additionally, a few power hiccups were noticed when the engine was cool in very low RPM’s (1.5-3k) at low speeds with and without clutch modulation. This could have been due to an issue with fuel mapping, ignition, the exhaust back pressure valve/servo motor, etc or just an anomaly because of the cold motor but did require some adaption. The transmission, however, seemed very unrefined. False neutrals were abundant throughout the gearbox on and off throttle. On multiple occasions, the transmission would fall out of gear when decelerating in 3rd or 2nd, throttle closed, fingers off of the clutch and foot completely off of the selector lever. Grabbing the clutch and kicking the shift lever up or down a gear solved this problem with a crunch but this issue arose multiple times throughout the day even after we jumped on another bike. 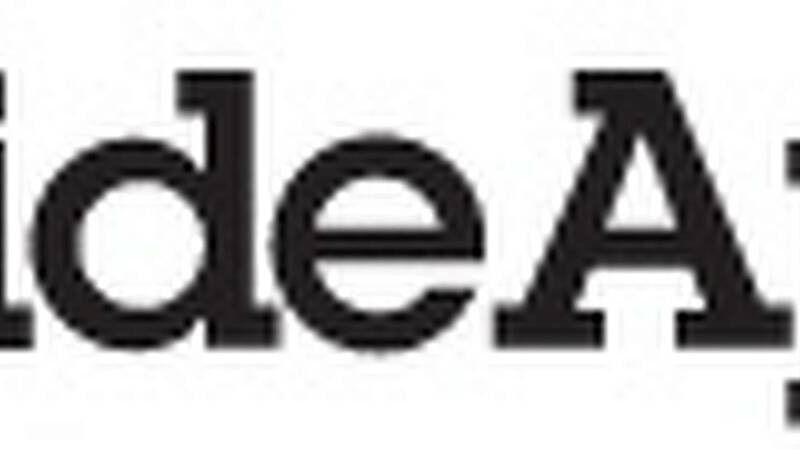 These sort of issues are going to be very confusing to newer riders as well as take away from the relaxed ride and care-free lifestyle targeted. Suspension performance wasn’t anything spectacular but held up well. The Kayaba components seemed properly sprung and dampened for this sort of bike. Travel in the front and rear is 5.9 inches allowing for many obstacles to be soaked up in rough conditions and decent performance on smooth roads. The single, offset rear shock could be slightly stiffer with a bit more feel added to the front end for additional corning performance but the bike handled quite well overall. More output would have to be produced from the powerplant before we’d really like to see the suspension parts beefed up. On the brakes, the bike comes to a stop smoothly and controllably. Despite the Panigale-sized 330 mm front disc, braking performance out of the single-rotor Brembo system is nothing near sportbike levels. Brake fade under hard binding is apparent as the hydraulic components heat up but the system is still able to produce pretty linear deceleration. The ABS system intervened a few times during our ride through the rain and dirty pavement but didn't upset the ride much at all. The anti-lock assistance is smooth and alert. 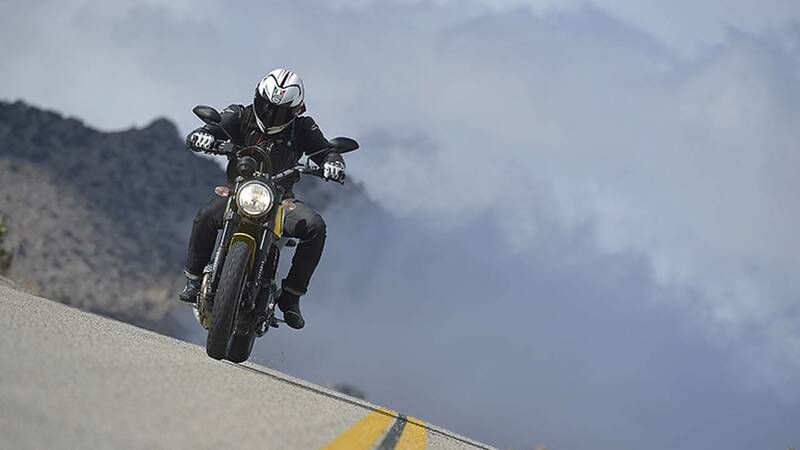 The Scrambler comes stock with Pirelli MT 60 RS knobby/road hybrid tires. Sizing in at 110/80R18 in the rear and 180/55R17 in the rear, street handling and performance is great. However, this knobby design does not do much in the way of traction once departed from pavement to dirt, sand or gravel. Things got squirrelly real quick with even light applications of throttle or brake unlike a true enduro or dual-sport. 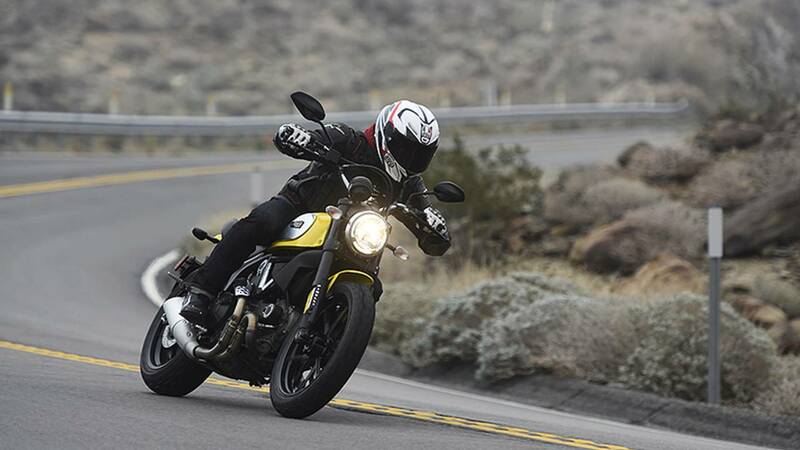 At the end of the day, the 2015 Scrambler is a solid bike that hits the target set by the task force Ducati deployed. The retro-styled bike produced with post-heritage design paying tribute to the originals of the 1960’s and 1970’s was attractive and ultimately impressive to even a skeptical, performance-oriented sport bike journalist like myself. Performance metrics are nothing outstanding and the transmission could use some fine tuning but perhaps these areas stand out because of Ducati's previous benchmarks set by other models. 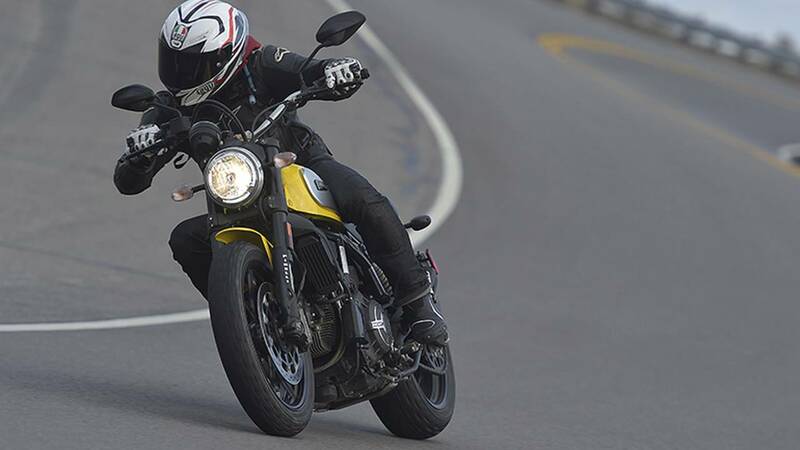 Those looking for a simple, retro-styled motorcycle that is fun and easy to ride with the design and reputation of a quality, historic brand like Ducati will find just what they are looking for in the 2015 Scrambler. Finally, with a MSRP of $8,495 for the Icon model we rode, this is an excellent value and ride for motorcyclists of all varieties.